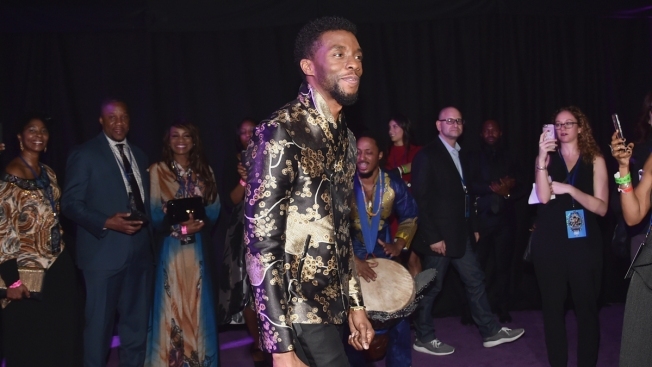 Just as "Black Panther" is setting records at the box office, a new study finds that diverse audiences are driving most of the biggest blockbusters and many of the most-watched hits on television. UCLA's Bunche Center released its fifth annual study on diversity in the entertainment industry Tuesday, unveiling an analysis of the top 200 theatrical film releases of 2016 and 1,251 broadcast, cable and digital platform TV shows from the 2015-2016 season. Among its results: minorities accounted for the majority of ticket buyers for five of the top 10 films at the global box office, and half of ticket buyers for two more of the top 10. "There has been some progress, undeniably. Things are not what they were five years ago," said Darnell Hunt, director of the center, which focuses on African American studies, at the University of California, Los Angeles. "People are actually talking about diversity today as a bottom-line imperative as opposed to just the right thing to do. We've amassed enough evidence now that diversity does, in fact, sell." Minorities make up nearly 40 percent of the U.S. population, but Hispanic and African-American moviegoers over-index among moviegoers. According to the Motion Picture Association of America, Latinos make up 18 percent of the U.S. population but account for 23 percent of frequent moviegoers. Though African Americans are 12 percent of the population, they make up 15 percent of frequent moviegoers. UCLA found that films with casts that were 21 to 30 percent minority regularly performed better at the box office than films with the most racially and ethnically homogenous casts. Hunt believes that the wealth of data, as well as box-office successes like "Black Panther," have made obvious the financial benefits of films that better reflect the racial makeup of the American population. "I think the industry has finally gotten the memo, at least on the screen in most cases, if not behind the camera," said Hunt. "That's where there are the most missed opportunities." The report, titled "Five Years of Progress and Missed Opportunities," covers a period of some historic high points for Hollywood, including the release of the best picture-winning "Moonlight," along with fellow Oscar nominees "Hidden Figures" and "Fences." But researchers found the overall statistical portrait of the industry didn't support much improvement in diversity from 2015 to 2016. "With each milestone achievement, we chip away at some of the myths about what's possible and what's not," said Hunt. "Every time a film like this does really well, every time we see a TV show like 'Empire,' it makes it harder for them to make the argument that you can't have a viable film with a lead of color. Or you can't have a universally appealing show with a predominantly minority cast. It's just not true anymore because the mainstream, itself, is diverse." Some of the largest disparities for minorities detailed by the UCLA report were in roles like film writers (8.1 percent of 2016's top films) and creators of broadcast scripted shows (7.1 percent). Hunt blamed the lag behind the camera on, among other factors, executive ranks that are still overwhelmingly male. "It's a white-male controlled industry and it hasn't yet figured out how to incorporate other decision-makers of color and women into the process. So you have these momentary exceptions to the rule," said Hunt, pointing to "Black Panther," which has grossed $700 million worldwide in two weeks of release. Such films, he said, show the considerable economic sense of making movies and television series that don't ignore nearly half of their potential audience. "It's business 101," Hunt said.